Horley with its surrounding villages is a thriving and vibrant community with a rather unique neighbour, Gatwick Airport. Horley sits in beautiful countryside halfway between London and the south coast of England. Its surrounding village communities include Burstow, Charlwood, Copthorne, Earlswood, Hookwood, Horne, Outwood, Salfords and Smallfield. Because of its closeness to Gatwick, Horley has many guest-houses and hotels serving the airport's visitors. Many local people work at Gatwick and many businesses benefit from the nearness of Gatwick. 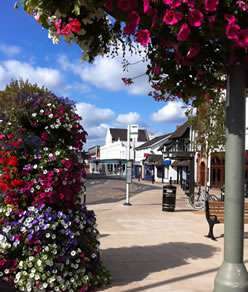 Horley Town Centre has a great range of shops, cafes, pubs and restaurants. Come into Horley on any day, if the weather is fine people will be sitting outside the small cafes - maybe after having drifted around the shops, found a bargain in a charity shop or enjoyed Horley's unique department store Collingwood & Batchelor. On a Sunday morning the boot-fair in the centre of Horley is a hubub of activity. The pubs in the centre of Horley serve food and drinks all day, some have live music, quiz nights or events in the evenings. There are a great range of restaurants to choose from in the Horley Town Centre. There are also unique restaurants and pubs just a short distance away in the surrounding villages. Local transport is excellent, with frequent trains from Horley Station to London or the coast. The Fastway bus service links Horley with Gatwick, Crawley and Redhill. Fastway buses run every fifteen minutes during the day from early in the morning until late at night. Local taxi firms are also always available. 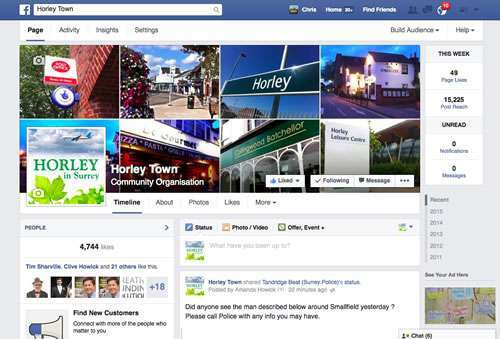 Horley has a population of over 22,000 people. New homes have been built on the outskirts of the town, including current developments such as The Acres and Smallfield Green. A major new development is underway for the North West Sector of Horley. Lots of activities take place, with many sports clubs, activity groups and events throughout the year. The Archway Theater in Horley has a packed programme, Horley Library provides a valuable resource that is more than just books, and Horley has a wonderful new swimming pool and sports complex. Our map of schools in and around Horley shows a list of the excellent schools in the area. All in all, Horley in Surrey is a great place to live.